This chapter describes the ADF Data Visualization components, an expressive set of interactive ADF Faces components. The functionality shared across the components and with other ADF Faces components is also highlighted. The remaining chapters in this part of the guide provide detailed information about how to create and customize each component. Section 22.1, "About ADF Data Visualization Components"
Section 22.2, "Common Functionality in Data Visualization Components"
Section 22.3, "Providing Data for ADF Data Visualization Components"
They are full ADF Faces components that support the use of ADF data controls. They provide for declarative design time creation using the Data Controls Panel, the JSF visual editor, Properties window, and Components window. Data visualization components include: charts, gauges, pivot tables and pivot filter bars, geographic maps, thematic maps, Gantt charts, timelines, hierarchy viewers, treemaps, and sunbursts. The prefix dvt: occurs at the beginning of each component name indicating that the component belongs to the ADF Data Visualization Tools (DVT) tag library. The chart components include nine types of charts with one or more variations for a total of over 13 different charts that you can use to display data. Chart components give you the capability of producing a variety of data visualizations that let you evaluate multiple data points on multiple axes in many ways. For example, a number of charts assist you in the comparison of results from one group with the results from another group. Area (areaChart): Represents data as a filled-in area. Use area charts to show trends over time, such as sales for the last 12 months. Area charts require at least two groups of data along an axis. The axis is often labeled with increments of time such as months. Bar (barChart): Represents data as a series of vertical bars. Use bar charts to examine trends over time or to compare items at the same time, such as sales for different product divisions in several regions. Horizontal bar (horizontalBarChart): Displays bars horizontally along the y-axis. Use horizontal bar charts to provide an orientation that allows you to show trends or compare values. Bubble (bubbleChart): Represents data by the location and size of round data markers (bubbles). Use bubble charts to show correlations among three types of values, especially when you have a number of data items and you want to see the general relationships. For example, use a bubble chart to plot salaries (x-axis), years of experience (y-axis), and productivity (size of bubble) for your work force. Such a chart allows you to examine productivity relative to salary and experience. Combination (comboChart): Chart that uses different types of data markers (bars, lines, or areas) to display different kinds of data items. Use combination charts to compare bars and lines, bars and areas, lines and areas, or all three combinations. Line (lineChart): Represents data as a line, as a series of data points, or as data points that are connected by a line. Line charts require data for at least two points for each member in a group. For example, a line chart over months requires at least two months. Typically a line of a specific color is associated with each group of data such as the Americas, Europe, and Asia. Use line charts to compare items over the same time. Pie (pieChart): Represents a set of data items as proportions of a total. The data items are displayed as sections of a circle causing the circle to look like a sliced pie. Use pie charts to show the relationship of parts to a whole such as how much revenue comes from each product line. Scatter (scatterChart): Represents data by the location of data markers. Use scatter charts to show correlation between two different kinds of data values such as sales and costs for top products. Use scatter charts in particular to see general relationships among a number of items. Figure 22-1 shows examples of area, bar, horizontal bar, bubble, combination, line, pie, and scatter charts. 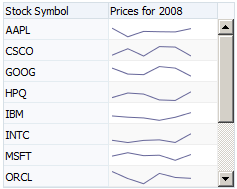 Figure 22-2 shows a line sparkchart displaying sales trends in a table column. The funnel, pareto, radar, and stock graphs are legacy server-side components, and their use is discouraged in favor of the client-side chart components. For information about using legacy graphs, see Appendix H, "Using Graph Components." For more information including additional use cases and examples, see Chapter 23, "Using Chart Components." The gauge (gauge) component is a measuring instrument for indicating a quantity such as sales, stock levels, temperature, or speed. Gauges typically display a single data value, often more effectively than a charts. Using thresholds, gauges can show state information such as acceptable or unacceptable ranges using color. Dial: Displays a metric value plotted on a circular axis. The gauge's background attribute determines whether the gauge's background is displayed as a rectangle, circle, or semicircle. An indicator points to the dial gauge's metric value on the axis. Example 22-0 shows three dial gauges with backgrounds set to full circle, partial circle, and rectangle. In all three examples, the gauge's metric value is 63. LED (lighted electronic display): Graphically depicts a measurement, such as a key performance indicator (KPI). Several styles of shapes are available for LED gauges, including round or rectangular shapes that use color to indicate status, and triangles or arrows that point up, left, right, or down in addition to a color indicator. Example 22-0 shows LED gauges configured with a variety of shapes, sizes, and thresholds. Rating: Displays and optionally accepts input for a metric value. This gauge is typically used to show ratings for products or services, such as the star rating for a movie. Example 22-0 shows four rating gauges configured with star, diamond, circle, and rectangle shapes. Status meter: Displays the metric value on a horizontal or circular axis. An inner rectangle shows the current level of a measurement against the ranges marked on an outer rectangle. Optionally, status meters can display colors to indicate where the metric value falls within predefined thresholds. Example 22-0 shows examples of status meter gauges configured as both horizontal and circular status meters. The gauges are configured to use thresholds that display color to indicate whether the gauge's value falls within an acceptable range. For more information including additional use cases and examples, see Chapter 24, "Using Gauge Components." 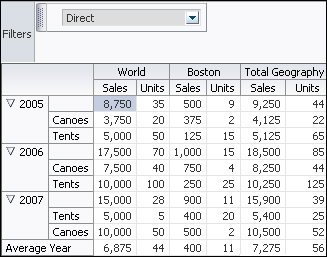 The pivot table (pivotTable) produces a grid that supports multiple layers of data labels on rows or columns. An optional pivot filter bar (pivotFilterBar) can be associated with the pivot table to filter data not displayed in the row or column edge. When bound to an appropriate data control such as a row set, the component also supports the option of generating subtotals and totals for grid data, and drill operations at runtime. Pivot tables let you swap data labels from one edge (row or column) or pivot filter bar (page edge) to another edge to obtain different views of your data. For example, a pivot table might initially display total sales data for products within regions on the row edge, broken out by years on the column edge. If you swap region and year at runtime, then you end up with total sales data for products within years, broken out by region. Pivot tables support horizontal and vertical scrolling, header and cell formatting, and drag-and-drop pivoting. Pivot tables also support ascending and descending group sorting of rows at runtime. Figure 22-7 shows an example pivot table with a pivot filter bar. For more information including additional use cases and examples, see Chapter 25, "Using Pivot Table Components." The geographic map (map) provides the functionality of Oracle Spatial within Oracle ADF. This component represents business data on a map and lets you superimpose multiple layers of information on a single map. This component supports the simultaneous display of a color theme, a graph theme (bar or pie graph), and point themes. You can create any number of each type of theme and you can use the map toolbar to select the desired themes at runtime. As an example of a geographic map, consider a base map of the United States with a color theme that provides varying color intensity to indicate the popularity of a product within each state, a pie chart theme that shows the stock levels of warehouses, and a point theme that identifies the exact location of each warehouse. When all three themes are superimposed on the United States map, you can easily evaluate whether there is sufficient inventory to support the popularity level of a product in specific locations. Figure 22-8 shows a geographic map with color theme, pie graph theme, and point theme. For more information including additional use cases and examples, see Chapter 28, "Using Map Components." A thematic map (thematicMap) component represents business data as patterns in stylized areas or associated markers and does not require a connection to a map viewer service. Thematic maps focus on data without the geographic details in a geographic map. The thematic map is packaged with prebuilt base maps including a USA base map, a world base map, as well as base maps for continents and regions of the world such as EMEA and APAC. The thematic map component does not require a map service to display a base map. 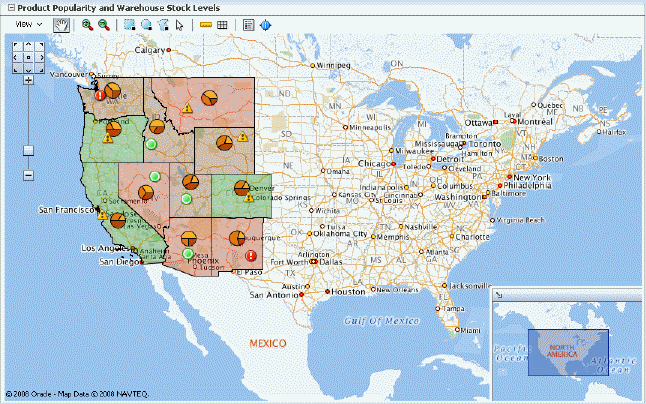 For example, you could use a USA base map with a states map layer to display the location of warehouses and customers, with high, medium, and low ratios using colors as displayed in Figure 22-9. The example illustrates thematic map default features including a data bound legend. The Gantt chart is a type of horizontal bar graph (with time on the horizontal axis) that is used in planning and tracking projects to show resources or tasks in a time frame with a distinct beginning and end. A Gantt chart consists of two ADF Faces tree tables combined with a splitter. The left-hand table contains a list of tasks or resources while the right-hand table consists of a single column in which progress is graphed over time. Project Gantt (projectGantt): Creates a Gantt chart that shows tasks vertically, and the duration of the task is represented as a bar on a horizontal timeline. Resource utilization Gantt (resourceUtilizationGantt): Creates a Gantt chart that shows graphically whether resources are over or under allocated. It shows resources vertically while showing their allocation and, optionally, capacity on the horizontal time axis. Scheduling Gantt (schedulingGantt): Creates a Gantt chart that shows resource management and is based on manual scheduling boards. It shows resources vertically with corresponding activities on the horizontal time axis. 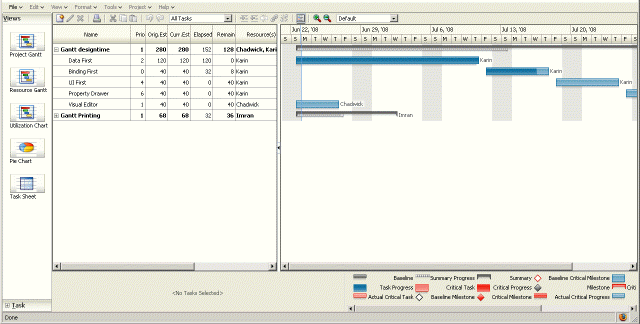 Figure 22-10 shows a project Gantt view of staff resources and schedules. For more information including additional use cases and examples, see Chapter 26, "Using Gantt Chart Components." A timeline is composed of the display of events as timeline items along a time axis, a movable overview window that corresponds to the period of viewable time in the timeline, and an overview time axis that displays the total time increment for the timeline. A horizontal zoom control is available to change the viewable time range. Timeline items corresponding to events display related information or actions and are represented by a line feeler to the time axis and a marker in the overview time axis. For example, the timeline in Figure 22-11 is configured to display the chronological order of the hire dates of employees. In this example, timeline items representing each event display information about the employee using an image and text with labels. The overview window defines the time range for the display of the timeline items, adjustable by changing the zoom control or by changing the edges of the window to a larger or smaller size. When selection is configured, the timeline item, line feeler, and the event marker in the overview panel are highlighted. A dual timeline can be used for comparison of up to two series of events. Figure 22-12 illustrates a dual timeline comparing employee change events for two employees over a ten year time period. 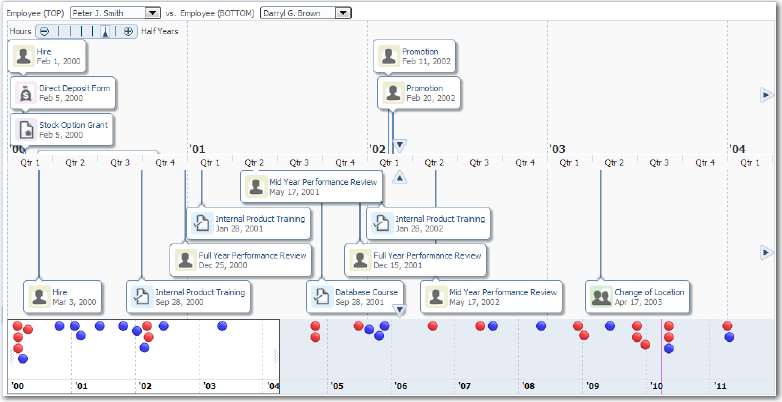 Timeline events are displayed using a quarterly year time axis within the three plus year overview window. The red colored line in the overview time axis indicates the current date. For more information including additional use cases and examples, see Chapter 27, "Using Timeline Components." 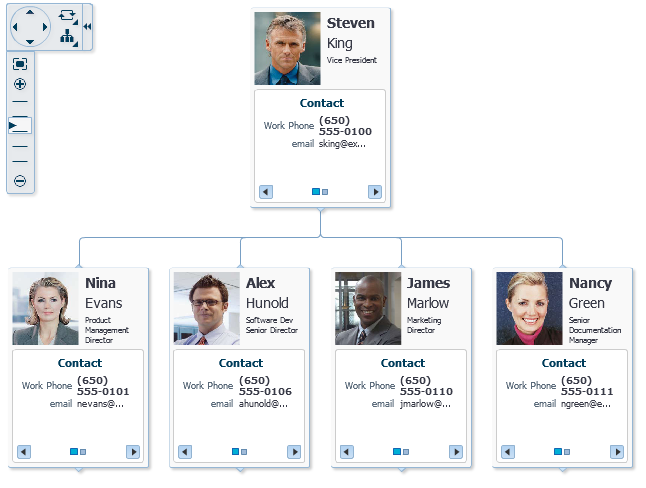 The hierarchy viewer (hierarchyViewer) component displays hierarchical data as a set of linked nodes in a diagram. The nodes and links correspond to the elements and relationships to the data. The component supports pan and zoom operations, expanding and collapsing of the nodes, rendering of simple ADF Faces components within the nodes, and search of the hierarchy viewer data. A common use of the hierarchy viewer is to display an organization chart, as shown in Figure 22-13. For more information including additional use cases and examples, see Chapter 29, "Using Hierarchy Viewer Components." The treemap and sunburst components display quantitative hierarchical data across two dimensions, represented visually by size and color. Treemaps and sunbursts use a shape called a node to reference the data in the hierarchy. For example, you can use a treemap or sunburst to display quarterly regional sales and to identify sales trends, using the size of the node to indicate each region's sales volume and the node's color to indicate whether that region's sales increased or decreased over the quarter. Treemaps display nodes as a set of nested rectangles. Each branch of the tree is given a rectangle, which is then tiled with smaller rectangles representing sub-branches. 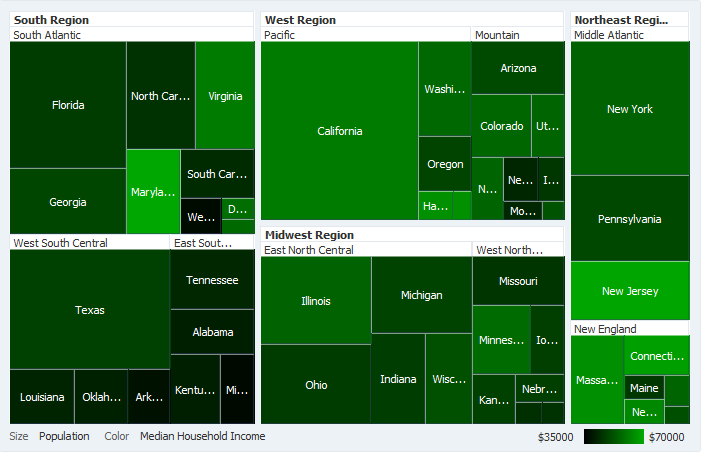 Figure 22-14 shows a treemap displaying United States census data grouped by regions, with the color attribute used to indicate median income levels. States with larger populations display in larger-sized nodes than states with smaller populations. Sunbursts display the nodes in a radial rather than a rectangular layout, with the top of the hierarchy at the center and deeper levels farther away from the center. 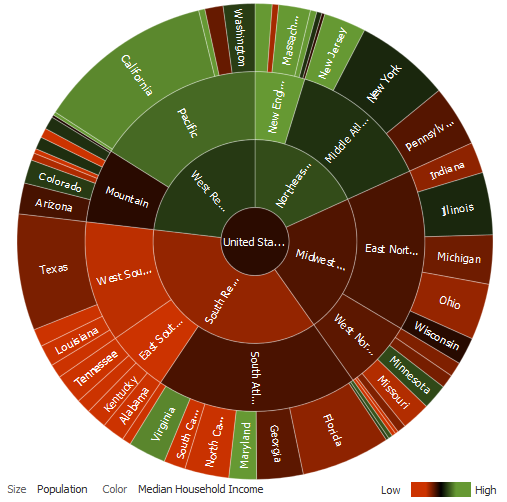 Figure 22-15 shows the same census data displayed in a sunburst. Use treemaps if you are primarily interested in displaying two metrics of data using size and color at a single layer of the hierarchy. Use sunbursts instead if you want to display the metrics for all levels in the hierarchy. Drilling can be enabled to allow the end user to traverse the hierarchy and focus in on key parts of the data. For additional information about treemaps and how to use them in your application, see Chapter 30, "Using Treemap and Sunburst Components." Partial page rendering: You may want a data visualization component to refresh to show new data based on an action taken on another component on the page. For more information, see Chapter 8, "Rerendering Partial Page Content." Personalization: Users can change the way the data visualization components display at runtime, those values will not be retained once the user leaves the page unless you configure your application to allow user customization. For more information, see Chapter 34, "Allowing User Customization on JSF Pages." Accessibility: By default, data visualization components are accessible. You can configure your application pages with data visualization components to be accessible to screen reader users. For more information, see Chapter 33, "Developing Accessible ADF Faces Pages." Touch devices: When you know that your ADF Faces application will be run on touch devices, the best practice is to create pages specific for that device. For additional information, see Appendix D, "Creating Web Applications for Touch Devices Using ADF Faces." Skins and styles: You can customize the appearance of data visualization components using an ADF skin that you apply to the application or by applying CSS style properties directly using a style-related property (styleClass or inlineStyle). For more information, see Chapter 31, "Customizing the Appearance Using Styles and Skins." Placeholder data controls: If you know the data visualization components on your page will eventually use ADF data binding, but you need to develop the pages before the data controls are ready, then you should consider using placeholder data controls, rather than manually binding the components. Using placeholder data controls will provide the same declarative development experience as using developed data controls. For more information, see the "Designing a Page Using Placeholder Data Controls" chapter of Developing Fusion Web Applications with Oracle Application Development Framework. Data visualization components share much of the same functionality, such as how data is delivered, automatic partial page rendering (PPR), the image format used to display the component, and how data can be displayed and edited. It is important that you understand this shared functionality and how it is configured before you use these components. Data visualization components including chart, gauge, Gantt chart, hierarchy viewer, pivot table, sunburst, thematic map, timeline, and treemap can be configured for how data is delivered from the data source. The data can be delivered to the components either immediately upon rendering, as soon as the data is available, or lazily fetched after the shell of the component has been rendered. By default all data visualization components, with the exception of the geographic map, support the delivery of content from the data source when it is available. The contentDelivery attribute of these components is set to whenAvailable by default. fetchSize: Specifies the number of rows in the data fetch block. The default value is 25.
horizontalFetchSize: Specifies the size of the horizontal data window in number of pixels in which the data are fetched. Only task bars within this data window would be rendered. In contrast with fetchSize, which provides vertical virtualization, horizontalFetchSize provides horizontal virtualization. levelFetchSize: Specifies the number of child nodes that will be fetched and displayed at a single time for each expanded parent node. Additional child nodes may be fetched and displayed by using the lateral navigation controls shown in the hierarchy viewer. The default value is 25.
rowFetchSize: Specifies the number of rows in a data fetch block. The default value is 25.
columnFetchSize: Specifies the number of columns in a data fetch block. The default value is 10.
displayLevelsChildren: Specifies the number of child levels to display during initial render. This property is 0-based. A value of 0 means that no child levels below the root will be shown; the root itself will be shown. The default value is 2, which means that the root and the first two levels of children will be shown. fetchEndTime: Specifies the end of the time range where data is currently being fetched. For lazy delivery, when a page contains one or more of these components, the page initially goes through the standard life cycle. However, instead of fetching the data during that initial request, a special separate partial page rendering (PPR) request is run, and the value of the fetch size for the component is then returned. Because the page has just been rendered, only the Render Response phase executes for the components, allowing the corresponding data to be fetched and displayed. When a user's actions cause a subsequent data fetch (for example scrolling in a pivot table grid for another set of rows), another PPR request is executed. When content delivery is configured to be delivered when it is available, the framework checks for data availability during the initial request, and if it is available, it sends the data to the component. If it is not available, the data is loaded during the separate PPR request, as it is with lazy delivery. Lazy delivery should be used when a data fetch is expected to be an expensive (slow) operation, for example, slow, high-latency database connection, or fetching data from slow data sources like web services. Lazy delivery should also be used when the page contains a number of components other than a data visualization component. Doing so allows the initial page layout and other components to be rendered first before the data is available. Immediate delivery should be used if the data visualization component is the only context on the page, or if the component is not expected to return a large set of data. In this case, response time will be faster than using lazy delivery (or in some cases, simply perceived as faster), as the second request will not go to the server, providing a faster user response time and better server CPU utilizations. Note that for components based on a tree or tree table model, only the value configured to be the fetch block will be initially returned. As with lazy delivery, when a user's actions cause a subsequent data fetch, the next set of rows are delivered. The whenAvailable delivery provides the additional flexibility of using immediate when data is available during initial rendering or falling back on lazy when data is not initially available. For more information about setting the fetch size for components based on the tree or tree table model, see Section 12.2.2, "Content Delivery." ADF Faces supports Partial Page Rendering (PPR), which allows certain components on a page to be rerendered without the need to rerender the entire page. In addition to built-in PPR functionality, you can configure components to use cross-component rendering, which allows you to set up dependencies so that one component acts as a trigger and another as the listener. For more information, see Section 8.1, "About Partial Page Rendering." By default, ADF Data Visualization components support automatic PPR, where any component whose values change as a result of backend business logic is automatically rerendered. If your application uses the Fusion technology stack, you can enable the automatic partial page rendering feature on any page. For more information, see the "What You May Need to Know About Partial Page Rendering and Iterator Bindings" section in Developing Fusion Web Applications with Oracle Application Development Framework. The Fusion technology stack includes the Active Data Service (ADS), which is a server-side push framework that allows you to provide real-time data updates for ADF Faces components and ADF Data Visualization components. You bind ADF Faces components to a data source and ADS pushes the data updates to the browser client without requiring the browser client to explicitly request it. Table 22-1 lists the DVT components that support active data and where you can find additional detail. Section 28.2.4, "What You May Need to Know About Active Data Support for Map Point Themes"
Section 25.1.2.11, "Active Data Support (ADS)"
Supports ADS only when the outputText component or sparkChart is configured to display the active data; other components are not supported inside collection-based component. Section 30.1.2.16, "Active Data Support (ADS)"
For additional information about using the Active Data Service, see Chapter 37, "Using the Active Data Service with an Asynchronous Backend." JDeveloper supports easy localization of ADF Faces and data visualization components using the abstract class java.util.ResourceBundle to provide locale-specific resources. For any text you add to a component, for example if you define the title of a pieGraph component by setting the text attribute on its child graphTitle component, you must provide a resource bundle that holds the actual text, create a version of the resource bundle for each locale, and add a <locale-config> element to define default and support locales in the application's faces-config.xml file. You must also add a <resource-bundle> element to your application's faces-config.xml file in order to make the resource bundles available to all the pages in your application. Once you have configured and registered a resource bundle, the Expression Language (EL) editor will display the key from the bundle, making it easier to reference the bundle in application pages. To simplify the process of creating text resources for text you add to ADF components, JDeveloper supports automatic resource bundle synchronization for any translatable string in the visual editor. When you edit components directly in the visual editor or in the Properties window, text resources are automatically created in the base resource bundle. For more information, see Section 32.2, "Using Automatic Resource Bundle Integration in JDeveloper." Any text retrieved from the database is not translated. For data visualization components with title and label child components, you can also create and add text resources to a resource bundle by using the attribute dropdown list to open a Select Text Resource dialog to select or add a translatable string from an application resource bundle. Alternatively, you can select Expression Builder to open the Expression Language (EL) editor to create an expression to be executed at runtime for the title or label. In JDeveloper you can add any Data Visualization component to your JSF page using UI-first development, and then later manually bind the data you wish to display using ADF data controls or managed beans. In this case you drag the component from the Components window to the page and manually bind the data in the Properties window. For example, when you are designing your page using simple UI-first development, you use the Components window to add a bar chart to a JSF page. 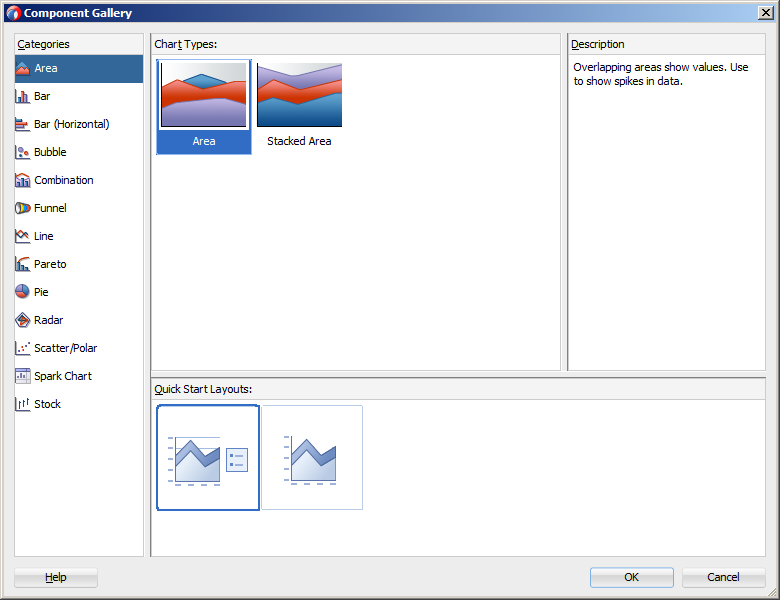 When you drag and drop a chart component onto the page, a Create Chart dialog displays available categories of chart types, with descriptions, to provide visual assistance when creating charts. You can also specify a quick start layout of the chart's legend. 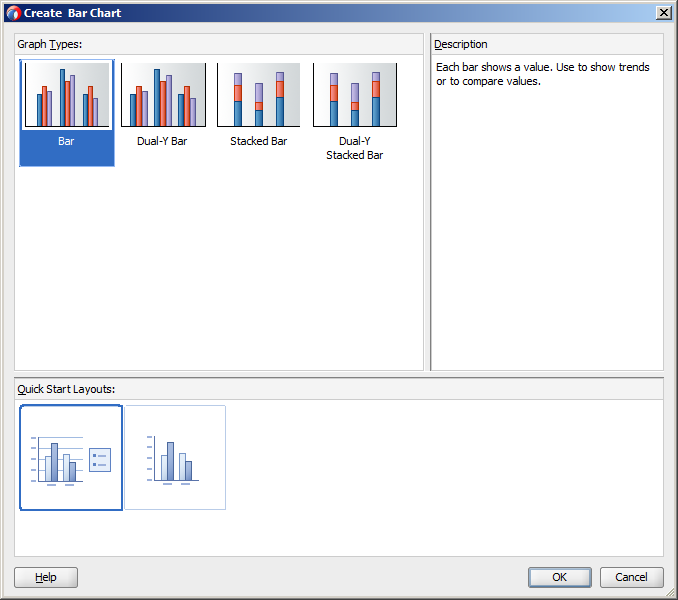 Figure 22-16 shows the Create Bar Chart dialog for bar charts with the default bar chart type and quick start layout selected. Chapter 23, "Using Chart Components"
Chapter 24, "Using Gauge Components"
Chapter 25, "Using Pivot Table Components"
Chapter 26, "Using Gantt Chart Components"
Chapter 27, "Using Timeline Components"
Chapter 28, "Using Map Components"
Chapter 29, "Using Hierarchy Viewer Components"
Chapter 30, "Using Treemap and Sunburst Components"
Alternatively, you can use data-first development and create the component using an ADF data control that will handle the data binding for you. In this case you drag a data collection from the Data Controls panel and complete the data binding dialogs to configure the display of data. For example, you can create and data bind a DVT chart by dragging a data control from the Data Controls Panel. A Component Gallery displays available chart categories, types, and descriptions to provide visual assistance when designing charts and defining a quick layout. Figure 22-17 shows the Component Gallery that displays when creating a chart from a data control. 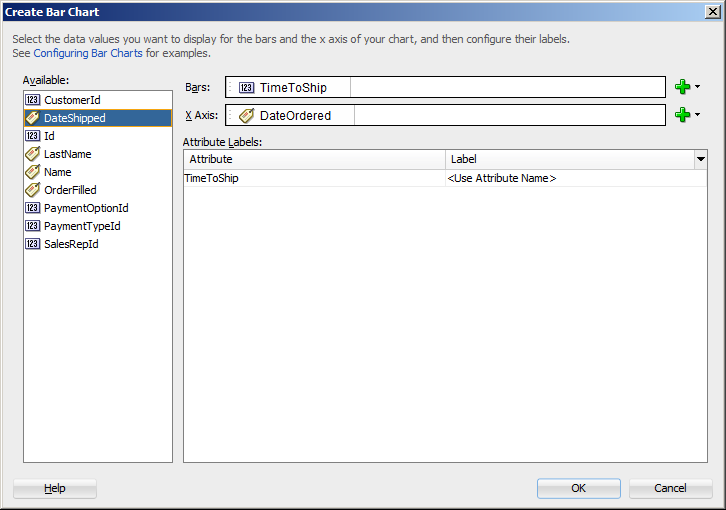 After selecting the category and type of chart you wish to create, a data binding dialog is displayed to bind the data collection attributes to the chart component. Figure 22-18 shows the Create Bar Chart dialog used to create and data bind a bar chart. "Creating Databound Charts" section in Developing Fusion Web Applications with Oracle Application Development Framework. "Creating Databound Graphs" section in Developing Fusion Web Applications with Oracle Application Development Framework. The funnel, pareto, radar, and stock graphs are legacy server-side components whose use is discouraged in favor of the client-side charts. "Creating Databound Gauges" section in Developing Fusion Web Applications with Oracle Application Development Framework. "Creating Databound Pivot Tables" section in Developing Fusion Web Applications with Oracle Application Development Framework. In JDeveloper, a Create Pivot Table wizard provides declarative support for data-binding and configuring the pivot table. "Creating Databound Geographic Maps" section in Developing Fusion Web Applications with Oracle Application Development Framework. "Creating Databound Thematic Maps" section in Developing Fusion Web Applications with Oracle Application Development Framework. "Creating Databound Gantt Charts" section in Developing Fusion Web Applications with Oracle Application Development Framework. "Creating Databound Timelines" section in Developing Fusion Web Applications with Oracle Application Development Framework. "Creating Databound Hierarchy Viewers" section in Developing Fusion Web Applications with Oracle Application Development Framework.